Boat Description If you want to leave for the weekend without looking for a hotel, the 800 WalkAround is the boat youre looking for. One of the new prides of the Quicksilver family, the 800 WA can sleep 2 people, has a standard head with shower and features all the comfort you need.If skiing is your thing, the numerous storage compartments will keep the deck clear of clutter.Inside lockers will also keep the ship tidy and your belongings dry.The sun deck in front of the cabin is an excellent place to relax and enjoy the scenery.Youll be able to share the joys of cruising on the 800 WA with up to 7 people. 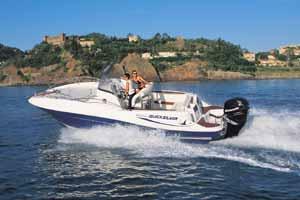 Standard equipment also includes Navman 6600 Track Fish, a sophisticated combination of GPS plotter and fish finder.